share a common focus: Sol. As the dominant body, Sol anchors orbits of all Solar objects. with AUs as the units. during equal intervals of time." an angle of equal size and shape reflects to other semi-orbit. 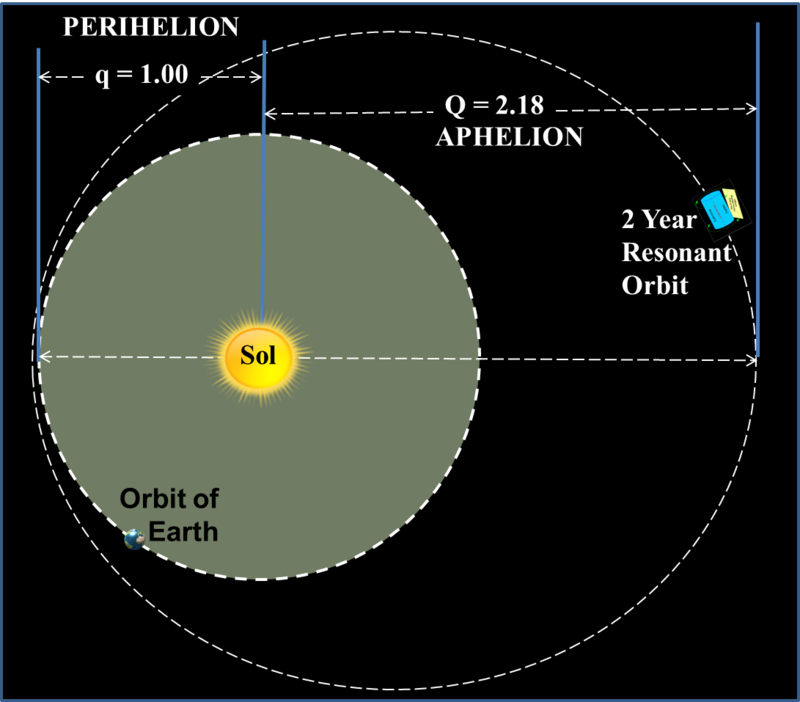 Orbit's major axis is line from aphelion through Sol to perihelion. Divide orbit into symmetric views below and above major axis. Top semi-orbit angles reflect to bottom view. Corresponding angles sweep equal areas and equal times. "Square of period is proportional to cube of semimajor axis, a." for orbital period to be 2.0 years. 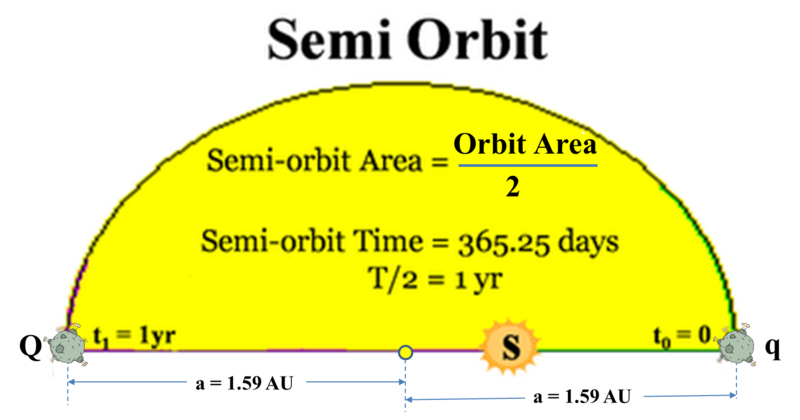 Per Kepler's 3rd Law, a 2 year orbit must have a semimajor axis (a) of 1.59 AU. However, semiminor axis (b) can range between 0 and 1.59 AU. 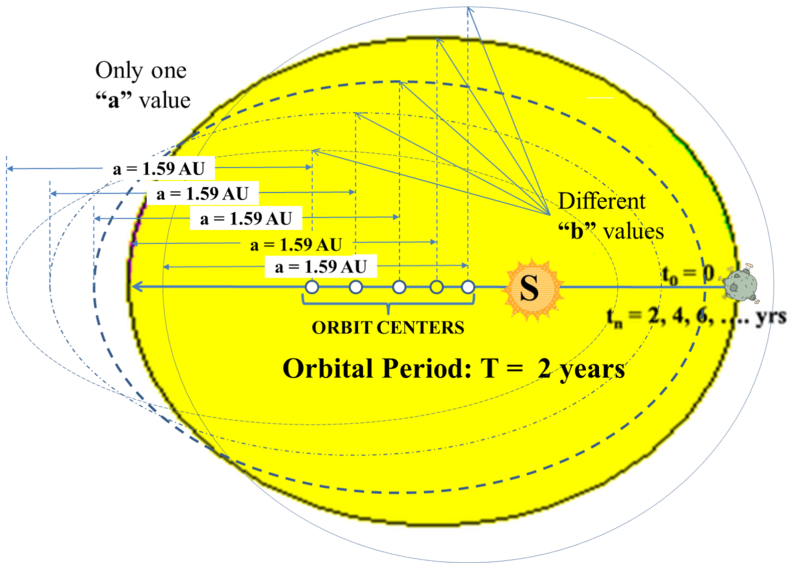 Thus, 2 year orbit's shape can vary between highly oblique to near circular. Also, different shaped orbits will have different centers (see figure). However, Sol remains the focus of all the orbits. Kepler's Second Law: equal areas give us equal times. will take half of the orbital period (2 years). Thus, travel time for top half of 2 year orbit is always one year. Same rule must also apply to bottom half. which is the remainder angle (∠Sup) in same semi-orbit. 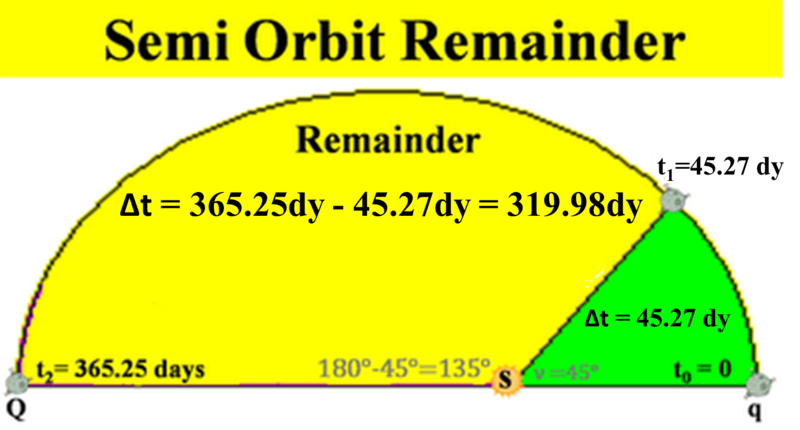 EXAMPLE: We might observe object orbits 45° in 45.27 days. PERHAPS THERE EXISTS A MORE ELEGANT METHOD to determine Partial Orbit Times. Positional vector, r, ranges from minimum, q, to max at aphelion, Q. Object's position can be in Polar Coordinates: (ν,r), angle and radial distance. thus, it's much easier to compute partial orbit times. then, the habitat could rendezvous with Earth every 2 years near q.
but still close enough for easy periodic payload exchanges. 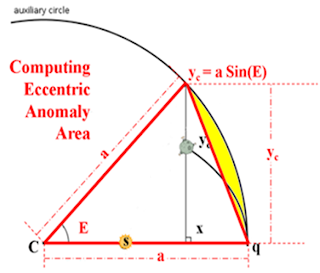 To approximate True Anomaly area, AT; divide sector into A∠ and AΔ. Triangle on left, A∠, area easily determined. Sadly, area of edge segment on right, AΔ, is not so easy (due to variable range). 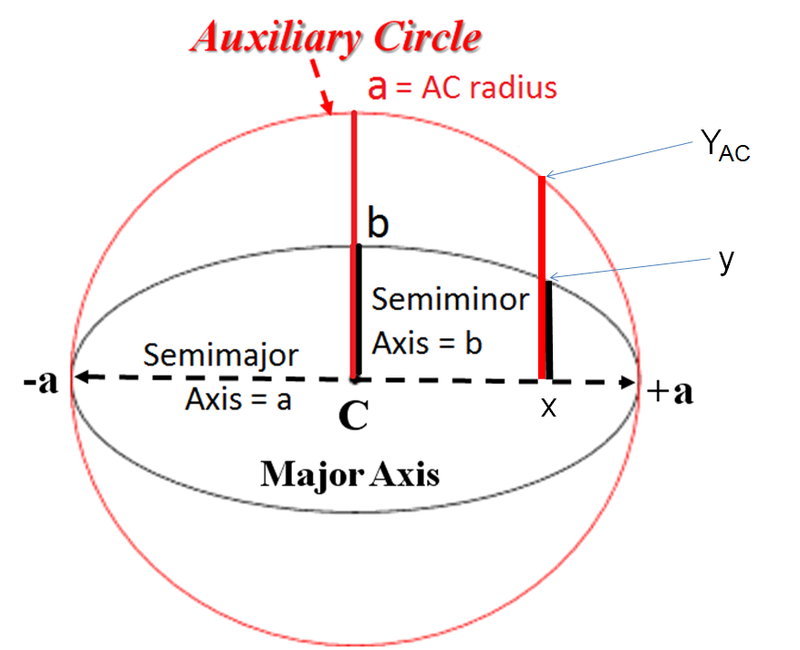 Auxiliary circle circumscribes an elliptical orbit. 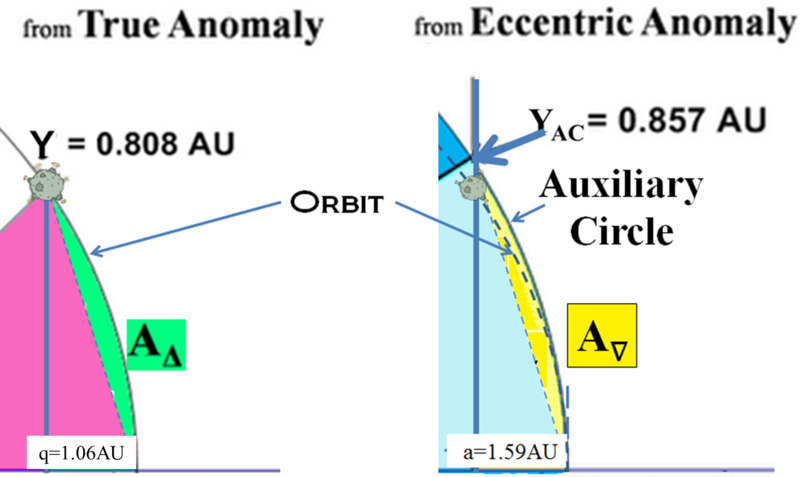 as well as the two endpoints of the orbit's major axis, -a and +a. At a constant distance from C, AC radius remains constant length, "a". ---a corresponding "y" on the elliptic orbit directly above x. 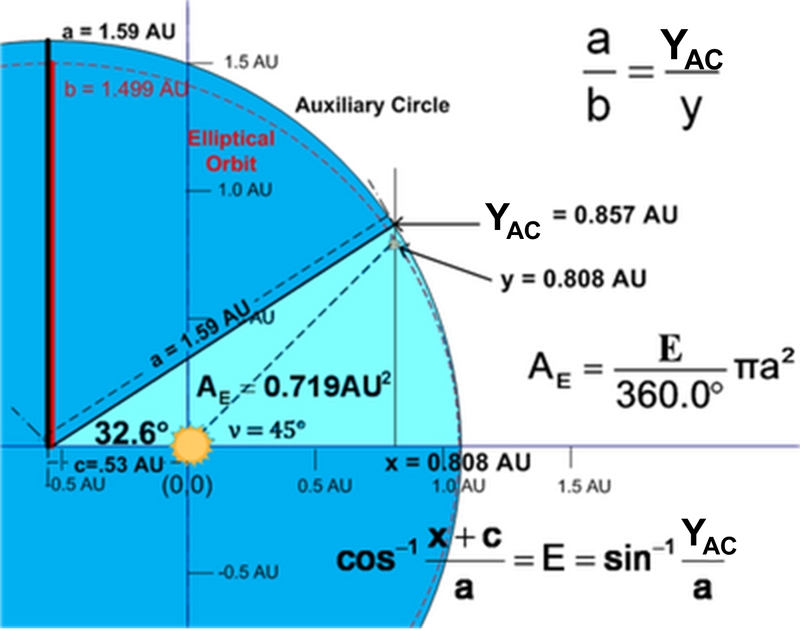 ---corresponding YAC value of point directly above x on AC. determined by object's superposition on Aux. Circle (YAC). E's apex at center, X position and Y position (YAC) form a right angle. divided into a triangle and an edge segment. Sector areas can be divided into triangles and edges. because it is an off center, ecliptic portion not a circular sector. However, we can approximate TA area with an inscribed triangle. Triangle, q-S-Ye, contains most TA area except for a small portion of eclipse as shown. Then, easily compute TA edge area (AΔ). Thus, use a : b ratio to estimate TA edge area (AΔ). indicates travel time to current position (ν = 45°). I. 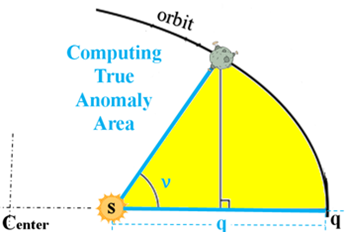 True Anomaly (ν) is an angle from q, orbit's closest point to Sol. 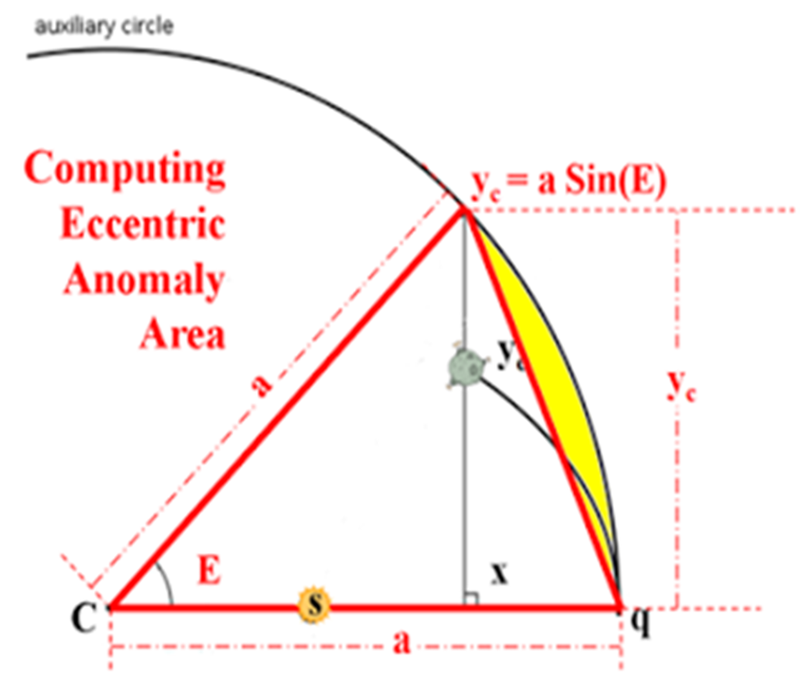 For every ν, there is a corresponding angle, E, Eccentric Anomaly. II. 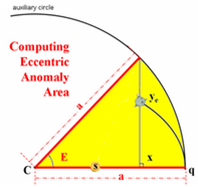 Every E has an area readily computed as a sector of the orbit's Auxiliary Circle. The E sector can be readily separated into a triangle and an edge area; both are easily determined. 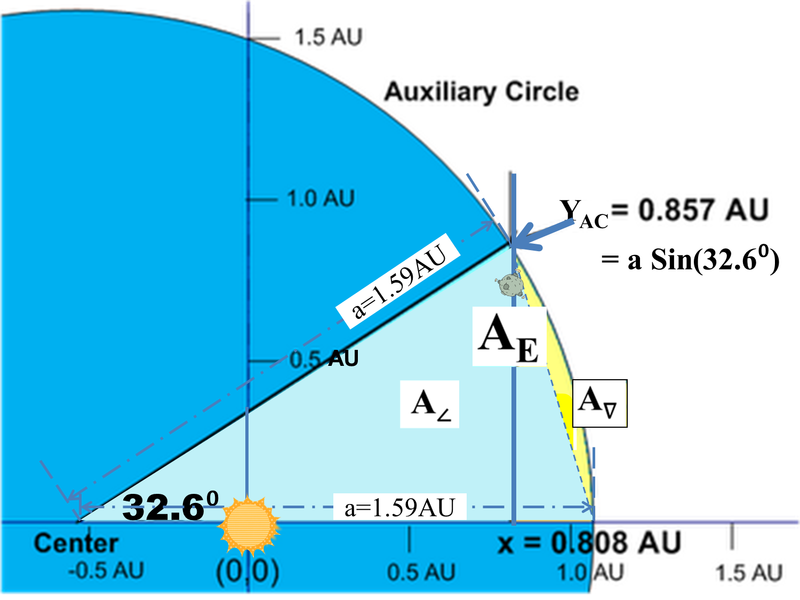 Let ν (Greek "nu") be an orbiting object's True Anomaly, the angle starting from the ray from Sol to q, orbit's perihelion. 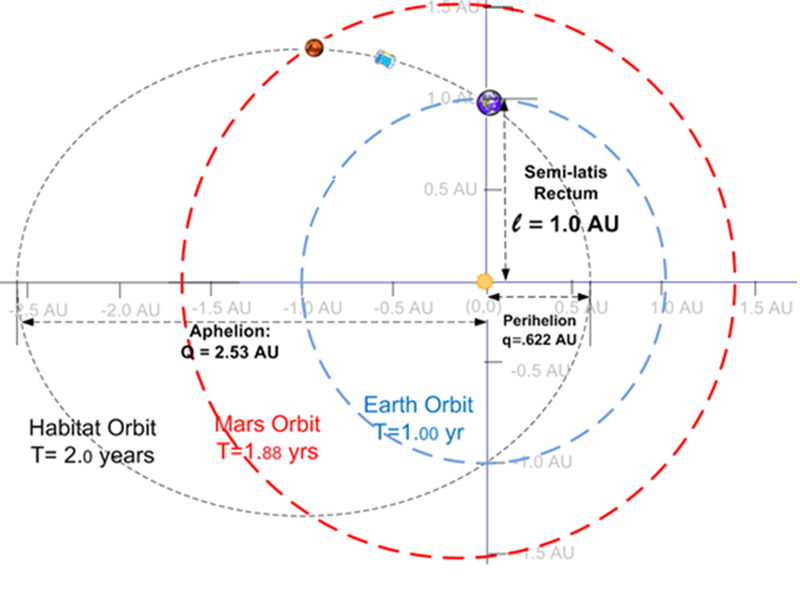 ν defines a sector with Sol at the apex with the object's orbit as the outside border. Travel time is along this outside border from q to yν. Let θ (Greek "theta") define a similar sector. 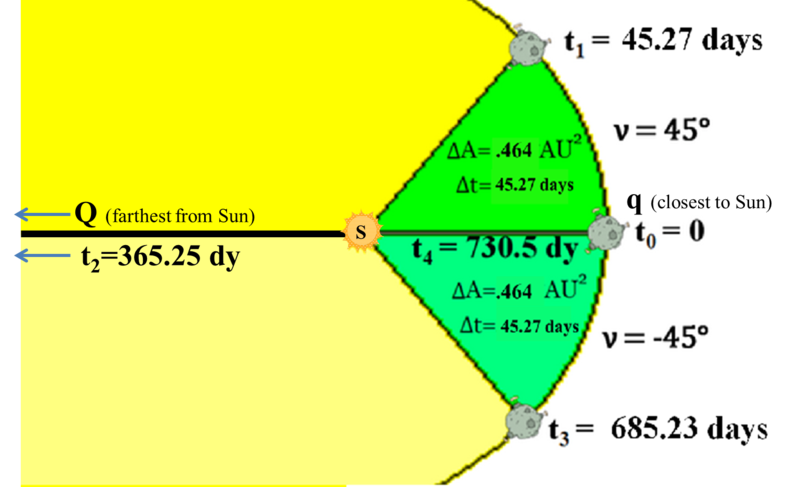 θ can be another angle which ends with the ray from Sol to Q, orbit's aphelion, with travel time from yθ to Q. For every sector defined by ν, there can be another sector of equal area defined by θ. Recall Kepler's 2nd Law states that if sector areas are equal; then, the travel times for the associated orbit portions are also equal. However, the sector shape for θ will differ from ν. 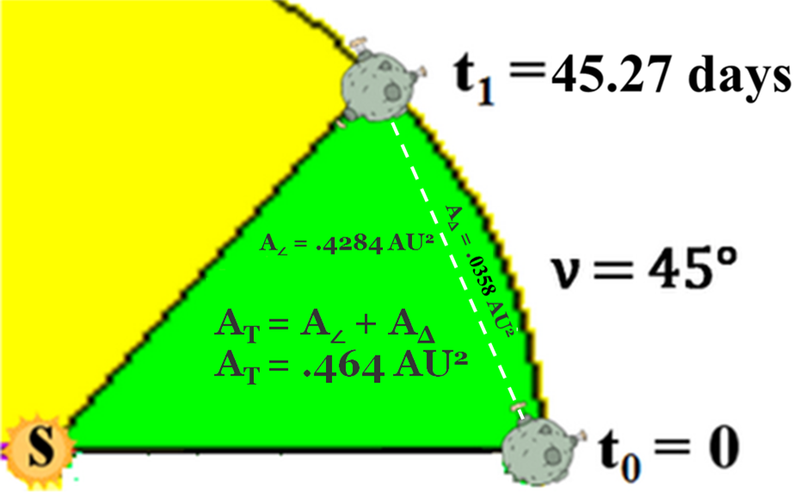 EXAMPLE: For a particular orbit, previous work shows that ν could equal 45° with area of 0.464AU² as well as a travel time of 45.27 days. Thus, we know the θ sector also has area of 0.464AU² and travel time of 45.27 days; however, we don't yet know θ's angular value. Each sector has two distinct areas: a triangle and an edge area as shown in the figure. ν and θ sector share a common apex at Sol which is also a shared vertex of the ν and θ triangles. ν-triangle's 3 vertices: Sol, q, and yν. θ-triangle's 3 vertices: Sol, Q, and yθ. Example defines the angle, ν, as known and the angle, θ, as unknown; however, we know some things about θ. By inspection, one readily determines that angle θ is much less than angle ν; thus, θ sector arc is much shorter and flatter than ν sector's arc. Thus, θ sector's edge area is much smaller than the corresponding edge of ν sector; itself, a very small portion of the entire sector. Triangle Area is one half Base × Height and approximates sector area. 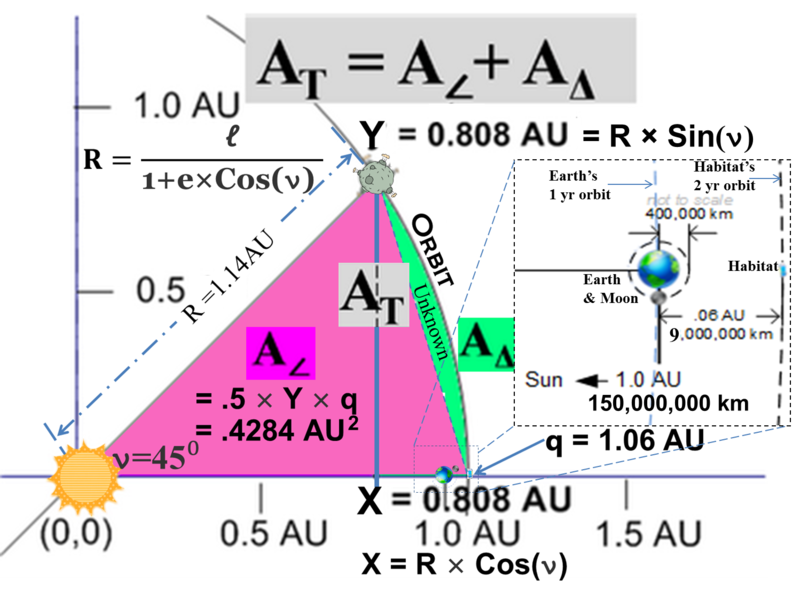 For any given orbit, θTriangle Base (aphelion, Q), is constant and easily determined. 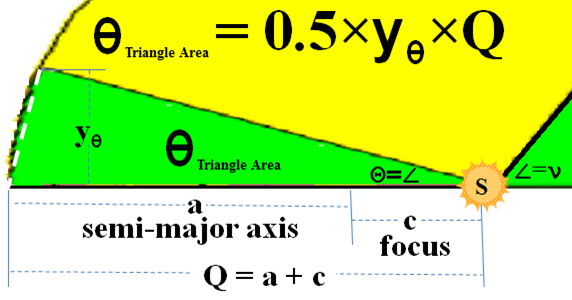 Height (yθ) can be determined from the triangle's area. determine θEdge area and subtract from sector. For initial guess of yθ , assume θEdge area to be about 1% of θSect. Electronic spreadsheet can quickly generate 100 rows of values from 1.01% to 2.00%. Following table shows a few selected rows.